Posh n Dirtiest | The Foodist. A culinary eclipse, the worlds of Street and Fine aligned in Moseley yesterday. Once a year its shadow casts magically onto beaming faces smeared with meat juices. Only this time, they claim it’s the finale of the “Meatshack takeover Carters” trilogy. I’ve heard of going out at the top but come-on guys we need more, demand more before you put this show into retirement. Meatshack’s poster, no copying or he’ll bite yer legs off! Yesterdays burgers included some Meatshack classics, a new cheeky strami and Brad Carter’s Buttermilk Fried Turkey burger. 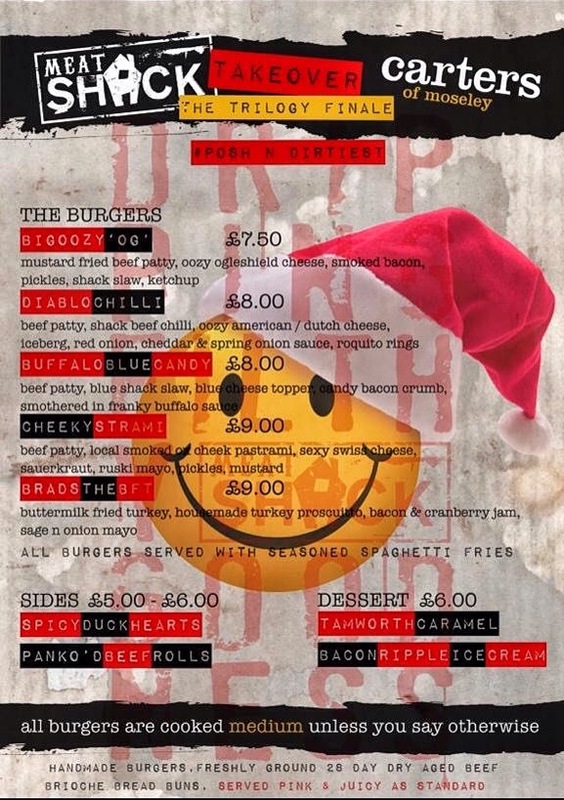 I mean look at that menu, don’t you think Birmingham deserves this every week if not every day of week?! I had to choose the strami burger as I’d heard the ox cheek pastrami was smoked by a great local artisan smokehouse (ok it was me) and it was a take on my all time favourite Reuben sandwich. The wife had the BFT and we both loved them. That same crusty juicy beefy patty on my burger but topped with soft, salty, peppery cheek pastrami, melty swiss and kraut. What’s there not to like? I had a bite of the BFT and it reminded me of the platonic ideal of a McChicken sandwich. That’s a good thing indeed if like me you remember them coming in, they were delicious back then or at least the memory of them still is! Special mention goes to the panko’d beef rolls, they had me wiping my chin with beefy drippings, and the special dessert. A chunk of Tamworth pork lard caramel peanut brittle sitting on bacon crumb ice cream hit all the right salty sweet and savoury notes when you’re doing this kind of “dirty” thing. The only shame is we can’t look forward to anymore. But maybe like the original StarWars trilogy they’ll be another trilogy and then hopefully a better trilogy after that!